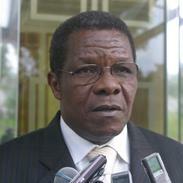 Joseph Kokou Koffigoh (born 1948) is a Togolese politician who served as transitional Prime Minister. He is the President of the Coordination of New Forces (CFN). Koffigoh served as the head of the country's Bar Association and in August 1990 he founded the Togolese League of Human Rights (Ligue togolaise des droits de l'homme, LTDH), which quickly won support both at home and abroad. He was elected as Prime Minister by the National Conference on 27 August 1991; President Gnassingbé Eyadéma was stripped of his powers and was left as a ceremonial president. Koffigoh was tasked by the Conference with forming a transitional government leading to elections that were then planned to be held in 1992, in which neither Koffigoh nor Eyadéma were to be allowed to run. Although Eyadéma had sought to suspend the Conference, surrounding the venue with soldiers, he subsequently accepted Koffigoh's appointment. Aside from serving as Prime Minister, Koffigoh also became Minister of Defense. Koffigoh's subsequent appointments of supporters and friends to head public enterprises led to some criticism and antipathy from other members of the opposition; this tendency of strengthening his own power base rather than the unity of the opposition has been viewed as a crucial mistake, weakening the opposition in the ongoing struggle against Eyadéma. In the months following his appointment, troops loyal to Eyadéma repeatedly tried to oust Koffigoh. On 1 October 1991, they seized the national radio and television station and demanded that Koffigoh resign before leaving the station; Koffigoh said afterwards on the radio that order was restored. A week later, they unsuccessfully tried to kidnap Koffigoh, and four people were reported killed in protests and violence that followed. After Eyadéma's party, the Rally of the Togolese People (RPT), was banned by the transitional High Council of the Republic (HCR) in November 1991, soldiers began a siege of Koffigoh's official residence in Lomé in late November, demanding that Koffigoh's government be replaced and threatening to "reduce the city to ashes"; they also demanded that the RPT be legalized again and that the HCR be dissolved. Koffigoh called for French military aid. Eyadéma publicly called on the soldiers to return to their barracks and expressed continued trust in Koffigoh, but also invited him to begin consultations on the formation of a new national unity government. Following Eyadéma's call, as well as talks between Eyadéma and Koffigoh and between Eyadéma and the soldiers, the soldiers lifted their siege after two days; however, they promptly resumed it. To appease the soldiers, Koffigoh offered to include supporters of Eyadéma in the government, but he refused to dissolve his government altogether, and he again called for French aid. On 3 December 1991, soldiers succeeded in capturing Koffigoh in a heavy assault, involving tanks and machine guns, on his official residence. Many people were killed in this violence: at least 17, and possibly more than 200. The soldiers took Koffigoh to meet with Eyadéma, and later on the same day, Eyadéma released a statement saying that he and Koffigoh would form a new transitional government to replace Koffigoh's previous government. Although Eyadéma did not take responsibility for the soldiers' actions, he was widely believed to have behind them. Koffigoh said in a news conference that he was not being held prisoner and that he was working on "getting things back on track"; although he remained in office, his power was considered curtailed. On 31 December, a new government headed by Koffigoh, including three members of the RPT, was announced; most members of Koffigoh's previous government remained, and Koffigoh himself continued to serve as Minister of Defense. The transitional period, which was originally set to end in August 1992, was extended at that point to 31 December 1992. Koffigoh dissolved his government on 1 September 1992, although it remained in place in a caretaker capacity; he and Eyadéma agreed on 2 September to holding electionslocal, parliamentary, and presidential, along with a constitutional referendumin stages before the end of the year. Koffigoh formed a new government on 14 September, with 18 ministers, including six from the RPT. On 9 November 1992, he dismissed two RPT members of the government, Minister of Territorial Administration and Security Agbéyomé Kodjo and Minister of Communications and Culture Benjamin Agbéka, but Eyadéma prevented their dismissal. A rally in support of Koffigoh, who said that he would appeal the matter to the Supreme Court, was held in Lomé on November 11. The opposition called a strike in the same month, but on December 29 Koffigoh called for the strike to end; as a result the Collective of Democratic Opposition-2 refused to participate in talks with Koffigoh on January 3, 1993. Eyadéma reappointed Koffigoh as Prime Minister later in the month, although the opposition and the HCR disputed this on the grounds that only the HCR had the right to appoint the Prime Minister. The Coordination of New Forces was established in 1993 as a six-party coalition, led by Koffigoh. He resigned as Prime Minister, along with his government, on 21 March 1994, following the February 1994 parliamentary election, in which the CFN won a single seat. Eyadéma appointed Edem Kodjo to replace Koffigoh in April, and Kodjo succeeded Koffigoh in office on 25 April. In 1997, Koffigoh was chairman of the organizing committee of the ACP-EU roundtable conference that was held in Lomé. Koffigoh subsequently became Minister of State for Foreign Affairs and Cooperation in the government named on 1 September 1998. As Foreign Minister, he headed peace talks in Lomé between the government of Sierra Leone and rebels of the Revolutionary United Front in mid-1999. Koffigoh served as Foreign Minister until he became Minister of Regional Integration, in charge of Relations with Parliament, in the government named on 8 October 2000. He served in the latter position until December 2002. Following the April 2005 presidential election, in which Eyadéma's son Faure Gnassingbé was officially elected President but which the opposition denounced as fraudulent, serious violence broke out in Togo. On May 25, Gnassingbé created a special 10-member commission of inquiry to examine the violence and deliver findings about it within three months, and he appointed Koffigoh as the head of the commission. The commission eventually delivered its report on November 10, 2005. The report cast blame for the violence widely; it included criticism of the government, the opposition, and the media, placed the death toll at 154, and gave recommendations for improving the electoral process. Koffigoh remains President of the CFN as of 2007. In the October 2007 parliamentary election, he was the first candidate on the CFN's candidate list in Kloto Prefecture, but the party did not win any seats in the election.